The British super-lightweight rivals headline at the Morningside Arena in Leicester this weekend with the winner moving a major step closer to a shot at a world title. With the fight live on BT Sport, it is by far the biggest fight of Chorley star Catterall’s career. But the former British champion (22-0) is all business heading into battle against Davies, who has lost just one of 19 as a professional. 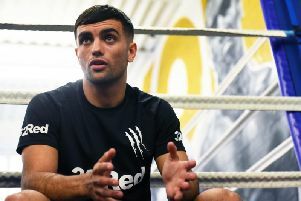 “I’ve boxed quite a few domestic fighters before but it’s never had the same build-up and excitement as this one,” said the 25-year-old, ranked No.2 in the world by the World Boxing Organisation. “It’s been good but it doesn’t bother me that much. I enjoy fighting, that’s the bottom line. “If everybody wanted to see the fight or it was in someone’s back garden it makes no difference to me. I’d still look forward to it as much as I am now. “I’m happy with what I’ve achieved but the ultimate goal is to get a world title. “I know I’m more than capable of that. In stark contrast to quiet man Catterall, Hackney’s Davies has made his reputation outside the ring as much as inside it. Controversy has followed the 26-year-old’s career, his only defeat coming to Scottish star Josh Taylor. “It’s shows that you don’t have to talk rubbish,” said Catterall. “He’ll probably say the opposite because we’re in the same fight and he’s got a lot of fights from talking himself into them. “I’ve worked hard, stayed in the gym, listened, learned and always accepted fights which I’ve then won to get me where I am. “I don’t have to act out of character or start doing daft things to get me in this position it’s through hard work. “It’s massive fight for both of us. Catterall-Davies tops a bill that also features double Olympic champion Nicola Adams. “To headline is an honour for me,” said the Chorley star.